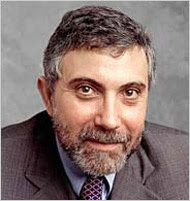 My SBS Dateline interview with Paul Krugman. STATE OF THE UNION: Members of Congress, I have the high privilege and the distinct honour of presenting to you the President of the United States. PROFESSOR PAUL KRUGMAN, PRINCETON UNIVERSITY: They've made no secret, the Administration doesn't say this but the people behind it do, that they view the whole welfare state, social security and Medicare as illegitimate. They want to reverse the New Deal and the Great Society, which means get rid of the house that Franklin Roosevelt built. On the social-cultural religious side, they've made it very clear that the boundaries between Church and State are something that they want to tear down. PETER MARTIN: Paul Krugman the 'New York Times' columnist is as blunt, and fearless, in his observations about the Bush Administration as Paul Krugman, the Princeton trade theorist, used to be about entire national economies. Back in the mid-1990s, at a time when just about everyone was talking up the Asian economic miracle, Krugman labelled it a myth. Three years later, those miracle economies collapsed. Now, with a twice-weekly column in America's most influential newspaper, the economist and opinion writer has begun issuing similar warnings about the US itself. PAUL KRUGMAN: As a share of GDP, our budget deficit is bigger than Argentina's before the 2001 crack up, as a share of GDP our current account deficit is bigger than Indonesia's before the 1997 crack up. Advanced countries get the benefit of the doubt from financial markets, because advanced countries are presumed to have the political will and the technical ability to resolve these very serious budget problems. We have the technical ability, I don't think politically we have any realistic discussion on the table. PETER MARTIN: The political problem that Krugman points to again and again in his columns is the Administration's multi trillion-dollar unfunded tax cut. He says it's sending American tax collections to their lowest level since the 1950s. In their place are borrowings from Asian central banks. He's worried even more by the attitude of the Administration that has pushed those tax cuts. PAUL KRUGMAN: The same tax cut that was proposed in 1999 at a time of surplus, at a time of a thriving economy, was the one that they pushed through in 2001 in the face of recession, and was extended and enlarged in the face of record budget deficits. The policy of tax cuts at the high end, permanent tax cuts at the high end, they sold it different ways, various things at various times, but it's always the same policy even though the economic situation and the budget situation is completely transformed. PETER MARTIN: Krugman's critique of the Bush Administration now extends way beyond its approach to economics. He says in all sorts of areas it appears to regard itself as a revolutionary force not subject to the usual political decision-making process. PAUL KRUGMAN: On foreign policy, they always wanted to get Saddam Hussein, and the fact that it was actually somebody else who attacked us didn't seem to make a difference. They decided, you know, the satirists do a better job of describing reality than serious journalists these days. And one satirist said that we sent a message to the world - "If you attack us, we will strike back with overwhelming force at someone else." And the notion that there could be a legitimate transfer of power back to the Democrats simply doesn't occur to these people. A number of people who are closely connected with the Republican Party from the religious right have said: "God chose Bush to be President, even exulted over the fact that he became President with fewer votes than his opponent, saying that just shows that he was God's choice." Almost a kind of right-wing Leninism. These are people who really have a very strong view about the way things should be, and are determined to achieve it. REPORTER: Are these sort of attitudes, dangerous ones in your view, that are easy to report on? PAUL KRUGMAN: The very extremism of what's going on makes it very difficult for journalists to talk about what's happening. PAUL KRUGMAN: Because the convention, if you're at 'Fox News', if you're with Murdoch, then the right wing is always right. If you are at another mainstream news source then the conventions is that there are two sides to every story, and it doesn't matter if one side is grotesquely untruthful, there are still two sides to every story. So, well, we had a spectacular example just a couple of days ago, we had new poll numbers which happen to have been shockingly bad for Bush, and most of the headlines in mainstream news reports on it had something like, "Poll shows weaknesses in both parties." And I've said that if Bush said that the earth was flat, the reporting in much of the mainstream press would be, "Shape of earth views differ." REPORTER: Why do you think you are not bound by those conventions in your writing? PAUL KRUGMAN: Well, first off, I am an opinion columnist. I have a little more... I write what I like, but beyond that I have another job. If my outrageousness causes me to lose my journalistic career, well so, I'll go back teaching and other things and so, I'm a little, and also I think I was just, because I am a trained economist, and can do my own arithmetic, I caught on to the fact that there was a lot of just raw dishonesty going on in this Administration before anyone else did, and have had the courage of my convictions because they're just grounded in arithmetic, which gives me a certain advantage over other people, but I'm much less alone than I was. PETER MARTIN: In recent weeks, Krugman has swung back to economics in his columns, warning of a financial crisis in the US very soon, quite possibly within the next 4-year presidential term. PAUL KRUGMAN: If the markets were to believe in us until the last possible moment we could have another 15 years before all hell breaks loose. I don't think it's going to work that way, but it could certainly happen during the next four years. PETER MARTIN: Might this be a good election for the Democrats to lose, in other words, to let George Bush deal with the results of what you see as the coming results of his Administration's policies? PAUL KRUGMAN: Well, I'll give you several thoughts on that. First was, that a lot of Democrats said during the disputed election of 2000, "Well, you know, whoever gets this is going to be handed a poisoned chalice, so it's probably better for us to let Bush have it," and that turned out to have been stark-raving mad, it turns out that the advantages of incumbency, the advantages of holding the White House are enormous, and Bush exploited that absolutely to the fullest, so, look, don't knock the advantage of being there. In particular, given the way things are trending in the United States, given the raw use of power to rig the political game that the Republicans have undertaken already, given the replacement of voting machines with electronic machines that leave no paper trail, given the extraordinary use of patronage to reward friends and punish enemies in the business community, I'm not sure that if the Democrats lose this election, they're going to have any chance of mounting a challenge in any future election no matter how badly things go. They've taken you for a ride, Mark. That's the concluding line to Ross Gittins' assessement of Latham's superannuation promises in this morning's Sydney Morning Herald. Forget the spin! It's a record record. The Australian recording industry should be congratulating itself. Both for pushing CD sales to an all-time record high and for keeping this fact out of the initial news reports. The announcement from ARIA is (perhaps deliberately) hard to read. For one thing, there are no comparisons with past sales going back more than a year. But late last year ARIA blessed me with a spreadsheet showing sales by category going back to 1982. Total sales (in all formats) climbed to a record high in 2003: 65.6 million, easily topping the previous record of 63.9 million set in 2001. And the sales of actual CD albums climbed above 50 million for the first time (well above 50 million actually). In its announcement ARIA makes much of a decline in the sales of its (reportedly unprofitable) CD singles - down from 11.3 million to 9.4 million. But if the industry reflected for a moment - it might see this as a good thing. CD singles were never an end in themselves. They were a promotional device - designed to feed listeners into buying the entire album. Music downloads may be (slowly) replacing the CD single in this role. They appear to do it much better (creating record sales of CD albums) - at virtually no cost to the record companies themselves! The industry has fought, it has screamed, it has arrested, it has litigated. But it may just be stuck with the best device for promoting its product it never wanted invented. See also: Forget the Spin, SMH 30.12.03. This reads as if I am angry. Well, yes – but the biggest winners would be Australia’s highest income earners. They are the people who put the most into super (both because they have the most to spare and because of its generous tax treatment, which Latham wants to make more generous still). A zero rate of tax on earnings would be quite an achievement for Labor. It is a step not even John Howard was not prepared to take when he neutered the capital gains tax. Here’s an idea – why not tax all earnings, even those from dabbling in financial markets, at the marginal rate. Despite what Latham is doubtless saying, it is a measure that would most likely not do much to increase the rate at which Australians save. Vince Fitzgerald notes in his landmark report (page 26) that “an increased return on saving is an incentive to save more, but also an incentive to save less.” “Save more” (through super) because it boosts the return on that sort of savings, “save less” because it makes it easier to reach a saving target. And to the extent that a zero rate of tax on super earnings does push more of our money that way, history suggests that will happen at the expense of other (more reasonably taxed) forms of saving. And what about Latham’s catch cry "65 at 65"? We could ask as well: what would those high retirement incomes buy? A higher retirement income for one Australian will buy that lucky Australian preferred access to the services of whatever working-age Australians are around during his or her retirement. But a higher retirement income for all Australians would not buy all of them all preferred access to those services (except at the expense of working age Australians). It would bid up the price of the services they wanted access to. Another cruel trick, don’t you think? Guess what? The best way to increase the purchasing power of our retirement incomes is to increase the number of workers around in our retirement years. That's what Costello proposes. He wants us to work longer. And that's what the AFR says Latham opposes. UPDATE: (18.03.04) It isn't true. In my anger I misread what Latham had promised. He has promised to eventually remove the (already concessional) 15 per cent tax on contributions, presumably leaving in place the (concessional) 15 per cent tax on earnings. This blunts my criticism but does not change the thrust of it. The biggest beneficiaries would still be those Australians who earned the most. But the policy would not, as I feared, run the risk of giving some Australians a higher standard of living after retirement than they had before it. For the two months or so I have been working on a story which went to air on SBS TV's Dateline on Wednesday 10 March. As you can see if you follow the link there is no transcript on the SBS site "on legal advice". COMMERCIAL IBT BANK, Licensed Offshore Bank (030085C), a licensed bank in Labuan Malaysia (www.lofsa.gov.my) is involved in investment banking and provision of financial services including corporate finance and advisory, private banking, trade finance and fund and asset management. We provide innovative financial solutions, support and auxiliary services ONLY to wholesale clients, sophisticated investors, substantial corporations and institutions globally. Our commercial and entrepreneurial approach has seen success in our specialist divisions. We have a good network in the Australia-Pacific, Asian and United States regions and specialise in providing investment opportunities in these regions. We strictly observe and preserve our clients' confidentiality and as such we are very private. We therefore do not publicise nor advertise any deals or projects unless requested by our clients. We are a full member of the Asian Bankers Association (ABA). The Asian Bankers Association, one of the service councils of the Confederation of Asia Pacific Chambers of Commerce and Industry, is a regional association and membership of financial institutions based or have operations in the Australia Asia-Pacific region. The Association aims to provide a forum for advancing the cause of the banking and finance industry in the region and promoting regional economic cooperation. Or that's what it used to say. The morning after my story went to air that description vanished from its website, replaced with: "This page is currently being updated". Here is what is there now. The website for Commercial IBT is here. The homepage for the bank here. Ratings Agency Malaysia suspends Commercial IBT's rating.